Geneva, January 17, 2017. The international aid organization CARE International has published a new report today highlighting ten humanitarian crises that have received the least media attention in 2016. 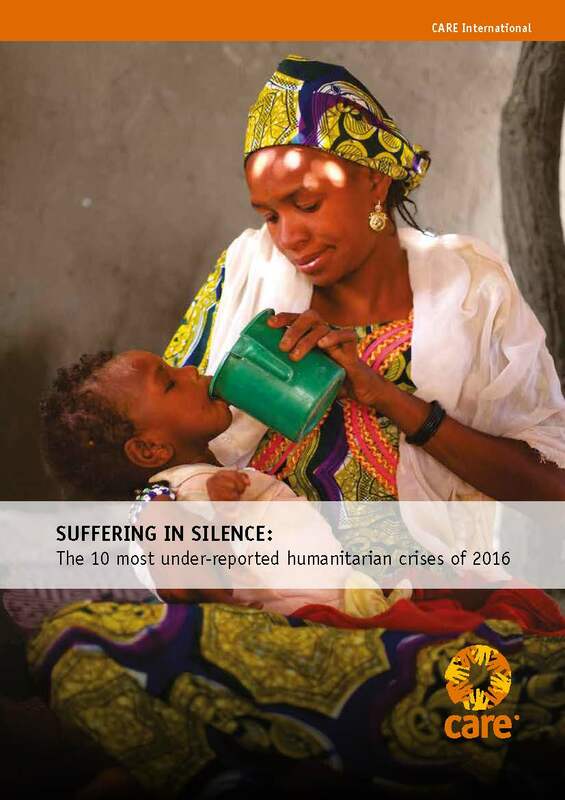 The report “Suffering in silence: The 10 most under-reported humanitarian crises of 2016” features the food crises in Eritrea, Madagascar, North Korea, Papua New Guinea; the conflicts in Burundi, Lake Chad Basin, Democratic Republic of Congo, Central African Republic, Sudan and last year’s monsoon floods in Bangladesh. “There are many disasters around the world that rarely make it into the news. With this report CARE aims to shine the spotlight on those humanitarian crises that have been neglected or eclipsed by others grabbing the world’s attention”, says Philippe Guiton, CARE International’s Humanitarian and Operations Director. In 2017, the world faces conflicts that are raging longer and longer. Poor families have to cope with typhoons, droughts and floods that are becoming stronger and happen more frequently. The UN’s Global Humanitarian Overview for 2017 requires $22.2 billion to help over 92 million people in urgent need. “Poor people must become more resilient to protect their lives, homes and livelihoods from recurring natural disasters. World leaders must assume their responsibility to prevent and end conflict. Ultimately, they hold the power to find political solutions to end bloodshed and suffering. They must step up their action”, Guiton urges. CARE International researched over 30 natural disasters and ongoing conflicts that affected at least one million people and analysed how often they were mentioned in online news articles. “Most of these crises will continue to need our support beyond 2017. Every day, families across the world live in constant fear for their survival as bombs are dropping in their neighbourhood, as floods or drought destroy their fields and kill their cattle, as brutal attacks force them to leave their homes. They deserve their stories being told”, says Guiton. Note to editors: Using the media monitoring services of Meltwater Group, CARE analysed those natural disasters or conflicts that received the least media attention in 2016. More than 250,000 global online sources were monitored in English, French and German. To filter according to scale, we chose countries in which at least one million people are affected by natural or man-made disasters. The result is a list of over 30 crises that we analysed and ranked by the number of articles mentioning each, starting with the one that received the fewest articles. Last year, CARE worked in 94 countries around the world to assist more than 80 million people improve basic health and education, fight hunger, increase access to clean water and sanitation, expand economic opportunity, confront climate change, and recover from disasters. To learn more, visit www.care-international.org.